If hard-rockin’ blues, stripped-down R&B and scorching slide guitars are your high test gasoline, then the Bluebirds are definitely the premium fuel for you. The Bluebirds hail from the northern-Louisiana town of Shreveport that has spawned such blues greats as Huddie “Leadbelly” Ledbetter and platinum-selling blues slinger Kenny Wayne Shepherd (who played his first professional gig with the Bluebirds). 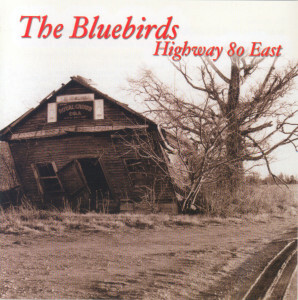 Anyone who has ventured out into the Southern blues circuit in the last seventeen years has probably heard the Bluebirds at one of their 150+ annual gigs! With Kerry Hunter on drums, Bruce Flett on bass and slowhand slider, blues sharpshooter extraordinaire Buddy Flett on guitar (yes…they are brothers), the Bluebirds echo the big-beat blues of Southern-style R&B, Creedence Clearwater Revival, and the “Tush”-era ZZ Top. Buddy’s guitar work scintillates throughout with the ferocity of Elmore James, the economy of Billy Gibbons and the Southern-fried soul of Lowell George. Leaner than a silver stiletto and tighter than a Saturday night party dress, Highway 80 East is likely to be the best blues/roots/R&B album you’ll hear this year.